Instagram famous baker Meghan Rosko made Starbucks Frappuccino macarons in honor of National Coffee Day this past Thursday, and they are insane! “The most challenging part of creating the Starbucks macarons was making the logo. The macarons were so small and in order to get the appropriate scale for the logo, I had to ice all of the logos with a tiny paintbrush." Uh, whoa. That is dedication to the craft. "I have no professional training in making macarons. I relied heavily on YouTube videos and blog posts." Here are her Snapchat “puppy filter” macarons. Here are her “sushi” macarons. 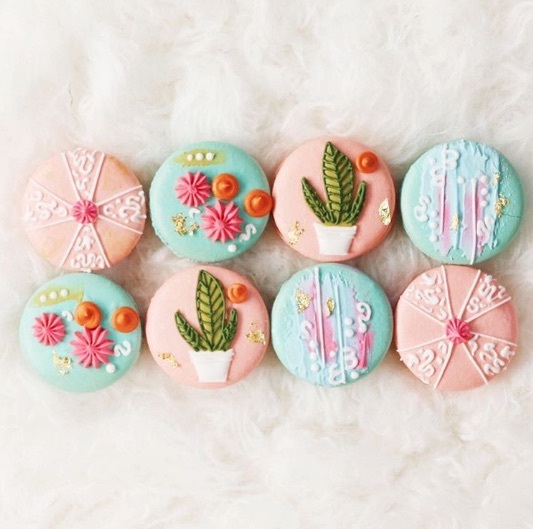 Here some just plain beautifully decorated macarons. And here are some kitty cat ones, because why not! And she doesn’t just make macarons — she makes beautiful baked goods of all kinds. We highly recommend you give her Instagram, @nutmegandhoneybee, a follow. The only thing left is for Rosko to open a store so we can grab some of these amazing creations for ourselves!